Now you stand next to your homonymous intelligence. 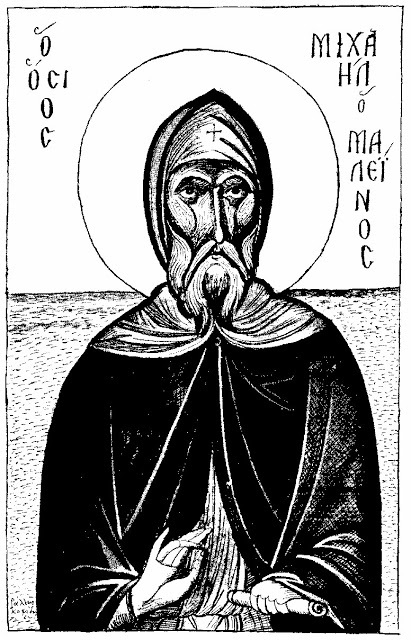 Saint Michael Maleinos was born about the year 894 in the Charsianon theme of Cappadocia, and at Baptism he received the name Manuel. He was related to the Roman Emperor Leo VI the Wise (886-911). He was the brother of general Constantine Maleinos and uncle of Nikephoros Phokas, who was greatly influenced by Michael and became Roman emperor several years after Michael's death (963-969). At age eighteen Manuel went off to Bithynia, to the Kyminas Monastery under the guidance of the Elder, John Heladites, who tonsured him into monasticism with the name Michael. Fulfilling a very difficult obedience in spite of his illustrious lineage, he demonstrated an example of great humility. After the passage of a certain time, he was found worthy of the grace of the priesthood. Constantly studying Holy Scripture, Michael showed how the priesthood ought to be properly conjoined with monasticism, he attained to a high degree of dispassion and acquired the gift of discernment. He was very compassionate and kindly towards people, he could not let remain without help and consolation those who were in need and in sorrow, and by his ardent prayer he accomplished many miracles. After much monastic effort under the guidance of Elder John, Michael asked his blessing to live in a cave as a hermit, Five days of the week he spent at prayerful concentration, and only on Saturday and Sunday did he come to the monastery for participation in the divine services and to partake of the Holy Mysteries. By his example of sublime spiritual life the holy hermit attracted many seeking salvation. In a desolate place called Dry Lake, the venerable Michael founded a monastery for the brethren gathering around him, and gave it a strict monastic rule. When the monastery was secure, Michael went to a still more remote place and built there a new monastery. 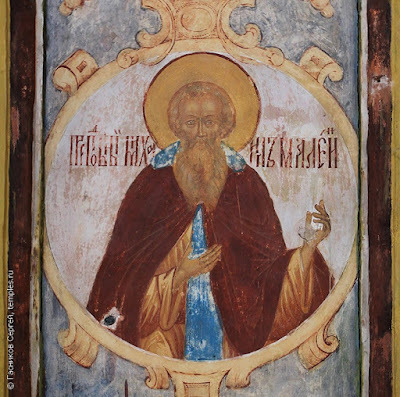 By the efforts of the holy elder, the whole mountain of Kyminas was covered with monastic communities, where constantly prayers were raised up for all the world to the Throne of the Most-High. About the year 953, the youth Abraham entered the brotherhood, flourishing under the guidance of Saint Michael, who gave him the name Athanasios. Later, Saint Athanasios (July 5) founded the renowned Great Lavra, the first cenobitic monastery on Mount Athos. 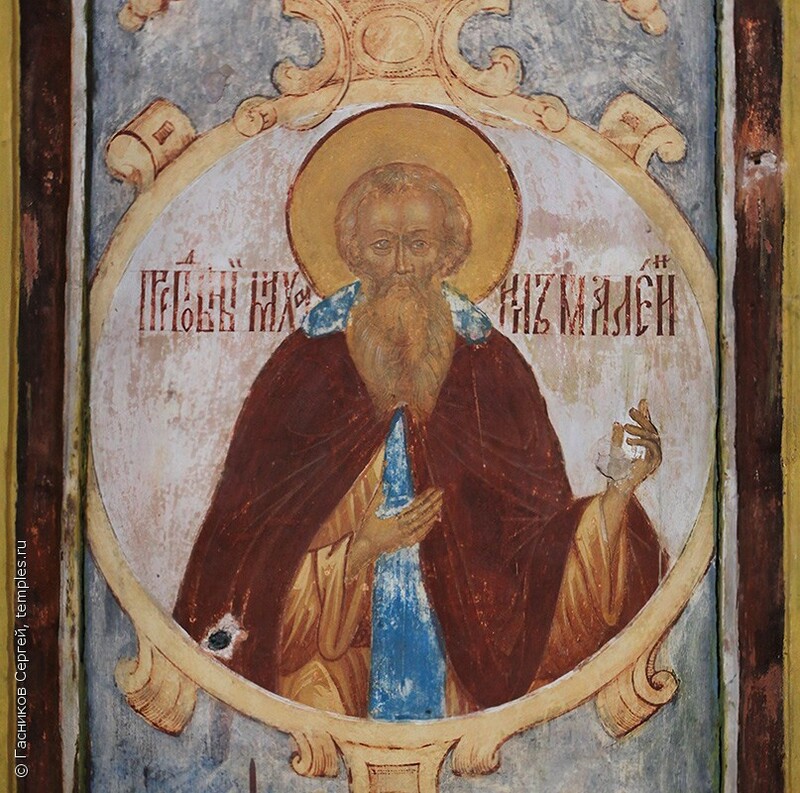 In the building of the Lavra great help was given to Saint Athanasios by Saint Michael’s nephew, the future Roman Emperor Nikephoros Phokas, who met Athanasios while visiting his uncle. 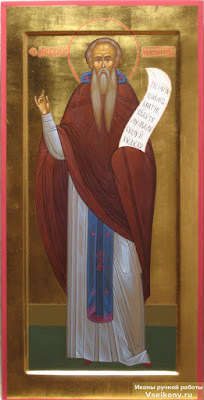 After fifty years of ceaseless monastic struggle, Saint Michael Maleinos departed peacefully to the Lord in the year 962. 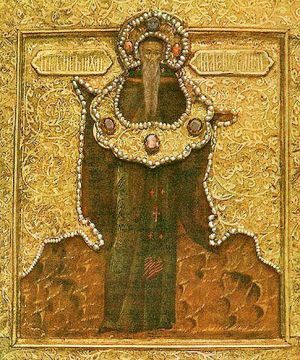 Saint Michael Maleinos was a patron saint of Mikhail Feodorovich (1613-1645), the first Romanov tsar. Owing to this fact, he was greatly revered by the Romanov dynasty and many chapels were dedicated to him in Russia. The image of God was truly preserved in you, O Father, for you took up the Cross and followed Christ. By so doing, you taught us to disregard the flesh, for it passes away, but to care instead for the soul, since it is immortal. Therefore your spirit, O holy Father Michael, rejoices with the angels. By your deeds you withered the arrogance of the flesh; through enlightenment you gave wings to your agility of spirit. You were revealed as a dwelling place of the Trinity, Whom you now clearly behold. Blessed Michael, unceasingly pray for us all.